Information This site boasts a beautiful and extensive shared use trail network with a mix of single-track and double track. Also located here are the Ryan Lahey Memorial (Soccer) fields and the Glooscap Heritage Archers Association. 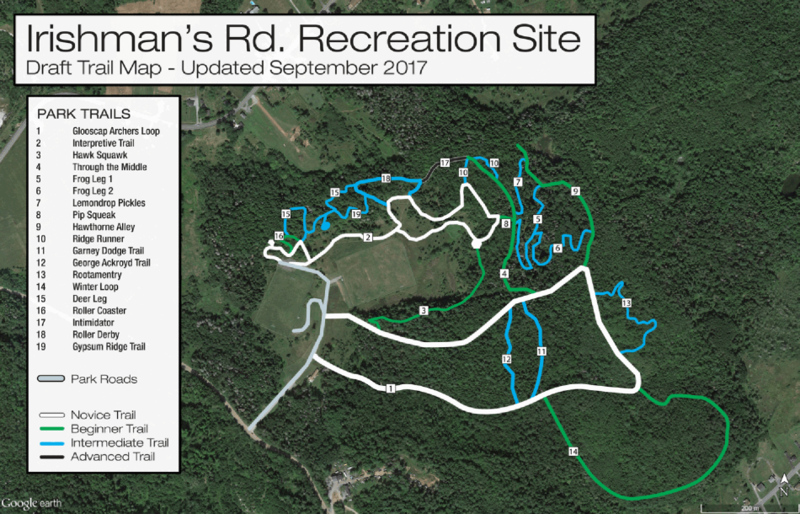 The trails are still being expanded upon and will eventually offer approximately 12-15 km of beginner to advanced trail loops. The Irishmans Road Recreation Site has very distinctive landscape features with high gypsum content and, as such, it is dominated by Karst topography and easy to distinguish sinkholes. Irishmans Road Recreation Site is owned by the Municipality of West Hants. Enjoy one-or all- of our 2018 Winter Guided Snowshoe Hikes held here and Castle Frederick Farms.